And in those days the Roman Emperor Max slew all the other 250 riders on an Italian bike nobody had ever heard of before. And few of us Philistines much cared, since two-strokes had been banished from the land years earlier. For this impression, then, MO had to travel to a foreign land, Aprilia! No, wait, that’s the name of the bike. Will they ever amount to anything? Massimiliano “Max” Biaggi rides an Aprilia 250. He’s pretty handy at it too, winning races, winning World Championships, winning everything. He’s the best 250cc racer of his generation — at least he is when he’s riding a 250 Aprilia. Now, for the second year, you can buy a replica of Max’s bike and dream that the set of bends ahead are in fact the corkscrew at Laguna Seca or the Melbourne loop at Donnington, and if we take this one on the limit we’ll have the race in the bag. The Aprilia RS250 takes the wannabe racer on the trip of their lifetime.A superficial glance at the spec sheet would suggest that Max’s GP racer and the RS250 street version are quite closely related. Both run a two-stroke V-twin power plant, although the street bike runs 56mm x 50 mm bore and stroke and the racer a square 54mm x 54mm. 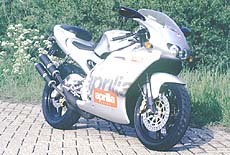 In 1994, when Aprilia decided to build a race replica to capitalize on their racing success they turned to the Japanese for the engine, realizing the work involved in building a reliable engine for the street was beyond the means of the small Italian company. Suzuki has been the only one of the Big Four who has continued to support the world market with limited numbers of its own pocket racer, the RGV 250, and it was Suzuki that Aprilia approached for the heart of their new bike. Aprilia builds their own pipes, play around with the ignition some for a better mid-range power delivery and raise the overall compression ratio, but essentially leave the RGV engine unchanged. The bike turns out a little over 60 bhp. Not very spectacular, but when hauling a bike weighing just 140 kg the result is acceleration that leaves the Japanese four-stroke 400s trailing in its wake. 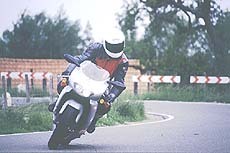 That is if you’ve learned the correct procedure for quick getaways, as it has a two-stroke’s typical hatred of low revs. Try riding away with a half-hearted tug on the throttle and the engine bogs and wheezes until 5000 revs appear on the clock, then spends another 3000 rpm clearing its throat. It finally wakes up at 8000 rpm and screams through to 12,000 in the blink of an eye. At 12,000 rpm you hit a brick wall, so there’s no point over-revving it, as there is nothing left. Plenty of clutch slip and 10,000 rpm on the clock will see the RS screaming away into the distance. 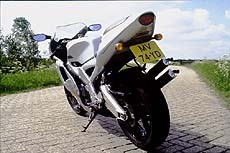 The exhausts have the sharp crack associated with racing two-strokes, and the only sound that comes close to it is that recorded by the on-board cameras at the bike GPs. Despite being a tuned two-stroke, the RS has few of the weaknesses of the two-strokes of the past. Starting the bike is a simple one-kick prod, regardless of whether the bike is warm or cold. The digital LCD display will tell you when the bike is warm enough to pull away, as it displays COLD until the water temperature reaches 30 degrees C. While cold, dense clouds of acrid two-stroke smoke waft around the bike. The RS is slow to wake up and requires a couple of minutes idling before the 30 C appears and it is ready to drive away. At anything much under its operating temperature of 55 degrees it’s one unhappy motorcycle, four-stroking at lower revs and reluctant to pull cleanly. Once warmed up, it will trickle along under the powerband without fuss and without any danger of oiled plugs. While Aprilia has just lightly tweaked the engine, they’ve really put their heart into producing a superb chassis that underscores the race replica claim. A beautifully polished alloy twin beam frame which looks surprisingly like the frame Biaggi and Aprilia production racebike owners use gives it the credibility it needs as a race replica. Both the Boge rear suspension and the Marzocchi front suspension offer full adjustability for bump/rebound damping and pre-load of the spring. The Brembo brakes offer excellent linear progression, and the low weight of the bike make front wheel “stoppies” just a determined squeeze away for the posers. Steering is light and sharp; the bike’s low weight makes it easy to throw into corners while the suspension does an excellent job of keeping the bike on the line you choose. The RS’s lightness can sometimes be a disadvantage, as it can get a bit skittish in strong crosswinds and move all over the place in the draft of large trucks on the highway. But motorways are not the RS’s natural environment. Although surprisingly large for a 250, it’s a squeeze to get behind the fairing if you are much over 5′ 8″. The handlebars are low, and within an hour of screaming along the highway the pain between your shoulder blades becomes excruciating. It’s the bike’s way of telling you to find some interesting bends to blitz and do some real interacting with the road, the bike, and your mind. Masochists determined to stick to the highway can wind the bike up to a speed of 125 mph on the dials, but this is not what the bike is about. We’ve left the best part of the bike until last – the styling. It is this more than anything else that makes it one of the masterpieces of this decade. This bike should be hanging in the New York Museum of Modern Art. The Italians have a reputation for classic car styling and recently, with the Ducati 916 and Aprilia 250, they have brought their expertise to the two-wheeled world with stunning results. Whereas the Japanese styling is usually achieved with eye-catching graphics, the Italians achieve the effect through the form of the bike. Deliciously understated in the racing silver color scheme, the eye is not distracted from the droopy nose fairing and the sculpted front fender. This really is a classic of the ’90s. For those less interested in riding a classic, they can go full hog with the black Chesterfield Biaggi replica. With a set of Dainese Biaggi leathers and AGV Biaggi helmet, you’ll look just like the man.It has to be said that the Aprilia RS250 is close to perfect, within the parameters defined for a GP race replica street motorcycle. Its only rivals are the Honda NSR250, Yamaha TZR250, and Suzuki RGV250, which are sold in Japan with an artificially restricted power output of 45 bhp. Only the Suzuki is currently available in other markets, and perhaps the new model, rumored to put out more than 70 bhp, could challenge the Italian machine. Until that time, the Aprilia RS250 will continue unchallenged on both street and track.